If you know the measurements of your wheelchair SAE with flange bearings, we make it easy to find exact wheelchair SAE with flange bearings that you need. It is easy to find out what kind of SAE With Flange Bearings that you need. All you have to do is measure your bearing the way we show you in the image. This is called the inside diameter. The Inside diameter is the length of the inside hole on the SAE With Flange Bearings. 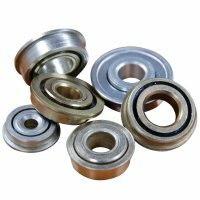 These bearing sizes are very similar so be sure that you get the exact measurement. Once you learn the inside diameter of the bearing that you need, you will need to figure out the outside diameter. The outside diameter is the full length of the SAE With Flange Bearings on the side without the flange. Browse these categories under "SAE With Flange Bearings"
Featured products under "SAE With Flange Bearings"